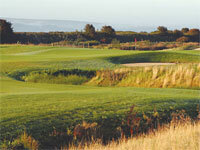 This stunning golf course is the first Nicklaus Design course in Wales. With it's stunning views across Carmarthen Bay and it's 7,100 yards of links style championship course it is a must for any golfer visiting South West Wales. Machynys is also proud to announce that it is the Ryder Cup Wales venue for the 2005 Wales Ladies Championship of Europe. With it's 5 star Brassier Restaurant, Health club and luxury spa as well as a full menu of massage and beauty treatments there is also something special for the après golfer in you.